It’s October already, and finally time for this year’s AABC Birth Institute 2018! And this year, we hope that Birth Institute is a little warmer, right? Nothing against Alaska 2017, but we are excited to get some sunshine and we’re sure you are too! Just like last year, Marketing TEA is going to be showing up at Birth Institute again this year being the OPPORTUNITY FINDERS that you all know and love! And the not-so-secret is that you can join us in creating incredible content of your own at Birth Institute 2018. Now, we know you already know about our over the top focus on content marketing; using videos, images, and written text to spread your message to your community. We’ve talked about it so many times! Like in THIS BLOG, THIS BLOG TOO, or EVEN THIS BLOG. But one thing we want to talk about more is how to find opportunities to gather some content for your business. And since we’ll be seeing so many of you at AABC’s Birth Institute 2018, we want to show you how your trip to Toasty Texas can become a massive opportunity for finding unique and engaging content for your community back home. First, consider the purpose of your attendance at Birth Institute 2018. While there may be a massive list of reasons to attend, your COMMUNITY will care about one reason in particular. You are attending to learn how you can make your birth center even better. How to make your birth center a safer, more empowered, more efficient and effective community icon – a symbol for natural birth in your community. Do you think your community cares about THAT? You bet. Even though we all may be thousands of miles from home, we can guarantee that your audience and community will care to know just how far you’d go to bring better birth to them. You really would walk 500 miles and 500 more just to bring better birth to your community (the authors apologize for making the same joke last year – but it’s still funny). A selfie photo OR video at the airport, in the car, or on horseback on the way to the conference. Show off your trip to and from Birth Institute 2018. Post to Instagram and tell your birth center fans about your wicked journey. An interesting flatlay (shot of things on the floor/table) of your everyday-conference-carry. Drop your nametag, a notepad & pen, your cup of tea, and any other related conference gear on the desk of your room at the very classy Worthington Renaissance Hotel and snap a pic of it. Show your community your gear for tackling the day and tell them what you’ll be learning about bringing better birth back home. A selfie photo OR video with the Marketing TEA crew (that’s us). Anyone lucky enough to come by our booth can be a part of a big wave of selfie videos we’re making to change natural birth in this country. See, we’ll even show you how to do it! A group pic with your lifelong AABC friends. We know you’ve made incredible friends through AABC. Show them off. An ‘end of day’ video. At the end of the day, take a quick video telling your community the top 5 most amazing things you’ve taken away from the day. Tell them why you can’t wait to bring your new knowledge back to your community. A video or photo of your favorite speaker – or maybe a selfie with the two of you together! Now, we’re not saying this has to be us, even though we do have a session this year and it WILL be the highlight of your conference. But try to pick a great, inspirational speaker from the conference and snap a pic with them. Tell your audience what you’ve learned from that person or how they inspired you to change your birth center. A ‘wrap it up’ video. In the Uber to the airport, on the plane, in the car on the way back home, or even after you’ve woken up from your jetlagged sleep following that red-eye flight. 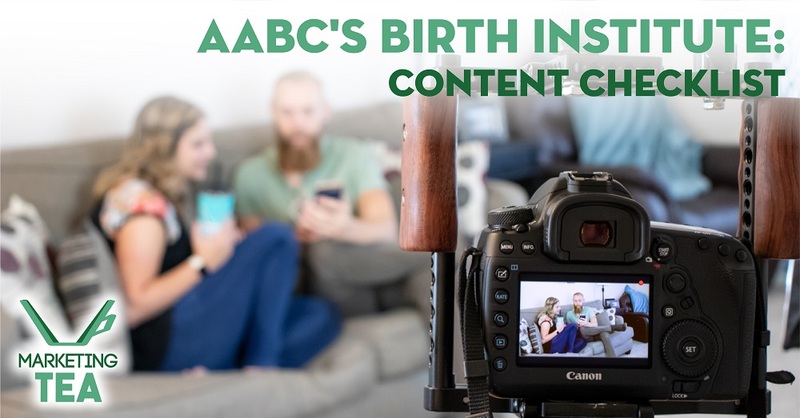 It doesn’t matter when – what matters is that you make one final video to tell your community about what an impact AABC’s Birth Institute 2018 has had on your birth center. We can’t wait to see you at AABC’s Birth Institute 2018. Stop by and say hello, and more importantly, enjoy Birth Institute!